That’s right folks….10 grand! 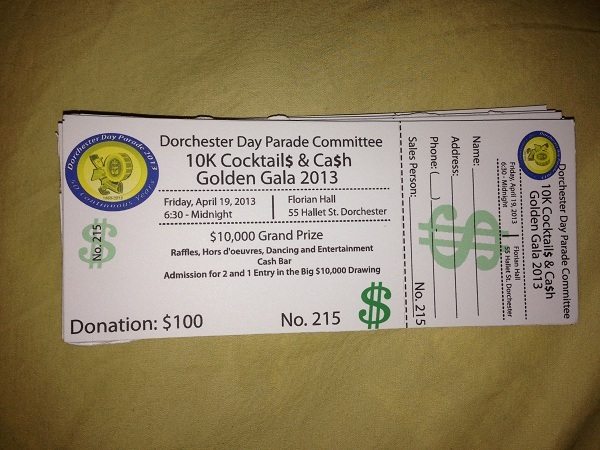 The Dorchester Day Parade Committee is getting ready to hold it’s 10K Cocktail$ & Ca$h Golden Gala on Friday April 19th at Florian Hall from 6:30PM till midnight. $100 will buy you a 1 in 300 chance to win $10,000 and admission for 2 to the Golden Gala. The Massachusetts State Lottery doesn’t produce odds like that my friends. I am personally taking some of this action! If you would like to just attend the Golden Gala, tickets for admission are $25. Proceeds go to support the 109th Dorchester Day Parade. There will be additional raffles, Hors d’eouvres (or food for you Dot Rats), Dancing and Entertainment with a cash bar. This is a great excuse to have a Dot Day party twice in one year! Help support this great Dorchester tradition! One Response to "Support the Dot Day Parade and win $10,000…"